The adorable-ness of the slimes is what originally drew me into the game, and the art style is fun and cutesy. The textures and landscape are a bit basic though. I have a hard time asking indie developers to focus on things like graphics, but this game could definitely benefit from improvements. The soundtrack is limited, and while the songs that are in the game work well, you’ll end up hearing them pretty often. Unfortunately they aren’t exactly earworms, so it gets repetitive pretty quickly. The gameplay and mechanics that are implemented are mostly smooth and balanced. The simple controls for the Vacpack work really well, and the ranch area of the game, though cramped, functions perfectly as a base of operations. Traveling around gets boring, especially as you find yourself going to locations further from your ranch. There are one-way teleportation points back to the ranch, but not between locations. By the time you are going to ‘higher-level’ places you aren’t wanting to stop for the ‘lower-level’ slimes along the way anymore so it adds tedium to progression. Nothing that can be considered an end-game has materialised. The only enemies thus far are Tarrs and occasional angry slimes, which can easily be avoided, even by returning to an area a few minutes later after they de-spawn. Without collectibles or an end point the game goes from delightful to repetetive after a few hours of play. Slimes in the wild can be extremely unruly. Not in a “it’s a gameplay mechanic” sort of way but as a general kind of chaos. Sometimes you’ll wander into an area and find multiple Tarrs, the main and only enemy in game, because the slimes spawn and immediately eat everything around them. Slimes would benefit from some AI refinement and a more complex needs system so that slime care feels more fleshed out and to avoid unnecessary chaos in the wild. 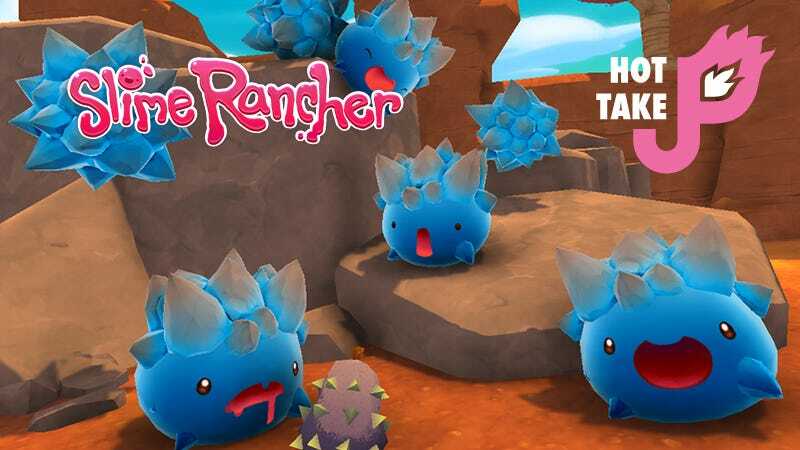 For $20 (I played on PC, but it’s also available on Xbox One) Slime Rancher is a perfectly decent title if you enjoy a specific kind of genre of games. For others looking just to try it out or who prefer more action/goal oriented I’d say wait for a sale. I criticized the soundtrack and graphics a bit, but feel guilty for it. Indie studios have a lot on their plate and allocating time and money away from gameplay for those are harder for smaller dev teams. That said, Monomi Park seems to be happy to keep the game fresh with updated content and patches, so I expect it to only get better.